NaphCare Selected as Correctional Health Provider at Federal Prison in Virginia – NaphCare, Inc.
Birmingham, Ala.— NaphCare, Inc., a leading correctional healthcare company, was selected by the federal Bureau of Prisons (BOP) to provide health care services for Federal Correctional Institute (FCI) Petersburg in Hopewell, Va., located near the state capital of Richmond. The FCI houses approximately 2,850 male federal inmates. The comprehensive award contracts NaphCare to oversee onsite and off-site health care through June 2024, partnering with local hospitals and physicians to provide care when an inmate’s medical needs warrant attention. NaphCare is the largest provider of health care services to the BOP, supporting medical care for more than 30 prisons housing approximately 65,000 federal inmates across the country. NaphCare, Inc., partners with correctional facilities nationwide to provide proactive, patient-focused healthcare. NaphCare aims to deliver efficient, cost-effective, quality care that meets and/or exceeds all national standards for correctional healthcare. NaphCare provides health care services to the federal Bureau of Prisons (BOP), serving more than 65,000 inmates at 31 prisons across the country. Additionally, the company provides comprehensive medical and mental health care, pharmaceuticals, dialysis services and a corrections-specific electronic operating system and health record (EHR), TechCare®, to city, county and state correctional facilities. Headquartered in Birmingham, Alabama, NaphCare has been family owned and operated since the company’s founding in 1989. For 30 years, NaphCare has been devoted solely to partnering with correctional institutions to provide quality healthcare to a unique and diverse population. Additional information can be found on the company’s website: www.naphcare.com. 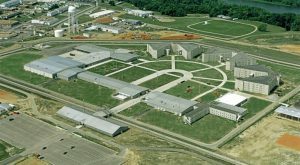 FCI Petersburg has both low- and medium-security facilities housing approximately 2,850 male federal inmates in Hopewell, Va.